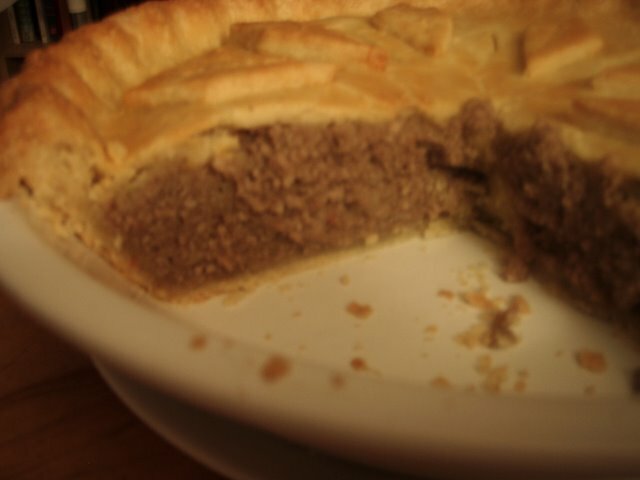 Here is the recipe I developed for Reveillon Tourtiere. Whatever pie crust recipe you are comfortable with will work fine, but I’m partial to all-butter pie crust for two reasons. First, I prefer the flavor, and second, butter is something I always have around. I’ve seen many recipes for pie crust that substitute shortening for some of the butter for added flakiness, and I know of one home cook who even adds just a touch of baking powder to give her pie crusts a little more lift. However, I urge you to try the butter crust using the fraisage technique to blend the dough. With a little practice, you should be able to get a flaky crust every time. For the filling or forcemeat, I prefer to add the spices and adjust the seasoning as I am mashing the cooked meat and potatoes. Some recipes I’ve seen call for seasoning when the potatoes and water are added, but I found that simmering dulled the flavor of the spices and I ended up having to use more. Besides, as the pie bakes, the meat will have plenty of time to meld with the spices. 2. If you can, use a food processor to cut the butter and flour together. Sprinkle the butter cubes over the flour mixture and just pulse a few times until it starts to resemble to texture of wet sand, or until there are pieces of butter no bigger than a small pea. Sprinkle the ice water over the mixture and pulse a few times more. If you don’t have a food processor, you can use a pastry cutter or your hands. 3. To blend the dough by fraisage, turn the dough out onto a floured surface and use the heel of your hand to smear the dough a little at a time against the board, adding more ice water a tablespoon at a time as needed. Work quickly, taking care not to let the heat of your hands melt the butter. If you have a plastic dough scraper you can use it instead of your palm and achieve similar results. Another method is to transfer the mixture to a bowl instead of turning it out on a board. Then use a rubber spatula to blend the dough by smearing it a little at a time against the side of the bowl. 4. Gather the layers of dough into two discs, wrap each disc and refrigerate at least 30 minutes before rolling. 5. Meanwhile make the filling. 1. In a large saute pan or wide saucepan, slowly render the salt pork on medium heat. Add the ground pork and ground beef and brown them. 2. Drain the excess fat. This is an important step because you are also draining the excess salt from the salt pork. It’s good to reserve it for making gravy if you wish. 2. Add the potatoes, onion, garlic and water. Simmer until the potatoes are soft and most of the liquid has evaporated. 3. Add spices and mash the potatoes and meat together. Adjusting the seasoning, adding salt if needed. Transfer the filling to a food processor, and pulse a few times to to get a finer grind on the meat. The size of the grind on commercially ground meat is coarser then tourtieres I’ve had. Unless you grind your own meat at home, you will need to process the mixture a bit to get the right texture. If you don’t have a food processor, you can just mash all the ingredients together, but the texture will be more like meatloaf or hamburger. 5. Cool the filling at room temperature. Meanwhile, roll out the dough and line the pie pan. If it gets too warm, refrigerate the prepared crusts briefly before filling the pie. 6. Assemble the pie. 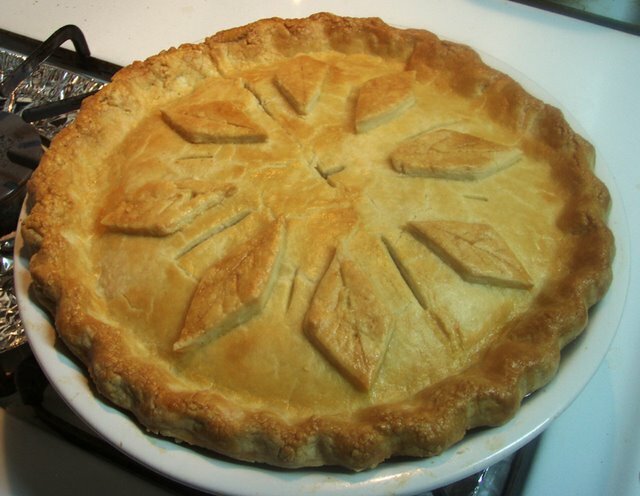 The filling can be warm, but should not be so hot that it melts the pie crust. After assembling, brush the top with the egg wash, cut vents in the top, and bake at 375 degrees for 40-50 minutes, or until the crust is golden brown and the middle of the pie is hot. You may need to cover the edges of the pie with foil if they start to brown too fast. You can substitute bacon or pancetta. The bacon will lend a nice smoky flavor. Pancetta will lend a more prominent herb flavor without the smoke. Have a great Easter!